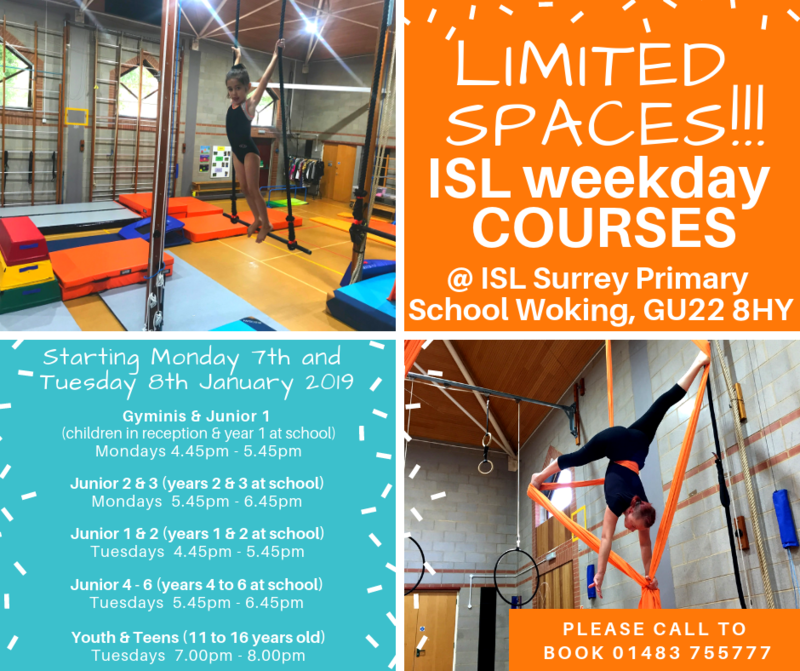 Limited spaces available for short courses at our a satellite centre, ISL Surrey Primary School, Old Woking Road (Google Maps link). Classes will follow the same unique coaching programmes in acrobatics and circus skills as our main Heather Farm facility and will be delivered by the same qualified and motivated staff, maintaining our low ratio and class sizes. The equipment will include a matted floor area, beams, bar, vault, airtrack & trampette for tumbling, as well as aerial points (silks, hoops, trapeze, straps and rope), a balancing globe, and traditional juggling equipment. Gyminis & Junior 1 (Reception & Year 1 school year) Mondays at 4.45-5.45pm from 7th Jan– 11th Feb. Junior 2 & 3 (years 2 & 3 at school) Mondays at 5.45-6.45pm from 7th Jan – 11th Feb. Junior 4 – 6 (years 4 – 6 at school) Tuesdays at 5.45-6.45pm from 8th Jan – 12th Feb. Youth and Teens (year 7 and over, focused aerial and tumble class) Tuesdays at 7.00-8.00 from 8th Jan – 12th Feb. Please call 01483 755777 for more details and to book!